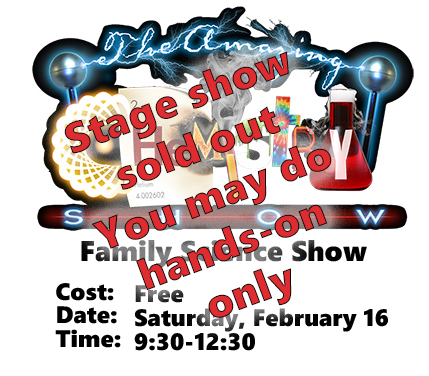 A free family science indoor show complete with explosions and crazy experiments. Includes two hours of hands-on experiments before and after the show. Doors open ar 9:30. First show starts at 10:00 (Reservation and free ticket required). The first show sold out at 11:00am Jan 21. The second show starts at 11:15. (reservation and free ticket required) You may do the hands-on before and after the second show. This show also sold out. Due to the overwhelming reponse we have negotiated a third show starting at 12:30. This is the final show and it is now sold out. No more tickets are available. These attendees must complete the hands-on experience prior to their show. The hands-on part closes at 12:30 for tear down and shipping. Even though both shows are full, families may attend the 75 station hands-on experience without a ticket they are just not be able to participate in the stage show. Those with tickets must bring their registration information (or e-ticket info) to the ticket window to pick up your actual show tickets. A truly family fun event.